I don't know anyone who has seen I AM BIG BIRD that hasn't cried somewhere in it. 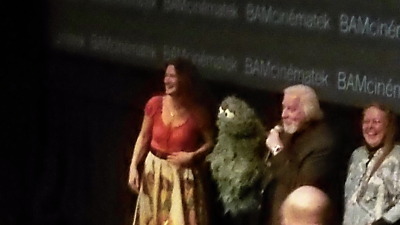 Even the subject of the film Caroll Spinney says he cries when he sees it-and he's seen it at least eleven times. I sobbed all my way through the film when I saw the film a few weeks ago at the Brooklyn Academy of Music. The screening was part of their Puppets on Film series. When it ended the audience gave it a long standing ovation. When Carroll Spinney passed me on his way to the stage he looked straight at me as I applauded and said "thank you"
If the measure of a man or a life is measured by the lives he's touched Spinney's life can't be measured since the number of people he's touched and the love he's created truly is immeasurable. I've never seen so many people go to mush in the presence of one man. At the BAM screening grown men didn't so much ask him for a hug as throw themselves at him, grabbing him with every fiber of their bodies and whispering with a cracked voice "Thank you". Two or three years ago when Mr Spinney was at New York Comic Con I watched as person after person, several who I saw joking with other famous people, go to his table and trembling told him how much he meant to them. There is something about the characters that Spinney created that causes us to once again be children and in awe of our heroes. ...the result of this is I can not really review I AM BIG BIRD in any conventional sense. I'm too close to the film if only because I know the moments too well, for Big Bird and Oscar (and thus Spinney) are not merely puppets or characters, but friends and family, whose ups and downs I shared over the last 45 years. I too found wonder when Big Bird went to China, cried when Mr Hooper or Jim Henson died and was in awe when I saw either Big Bird or Oscar in person. What I can do is say that if Big Bird or Oscar or the Muppets or Sesame Street or anything that Carol Spinney has ever touched means something to you, then see the film and see something amazing. This is not one of the best films of the year in any conventional sense, but something deeper and more visceral, this is one of the best experiences you're likely to have regardless of whether it's a movie or not. This is not just a celebration of one man's life, but of the wonderful things that he set loose on the world and thus made it a better place. 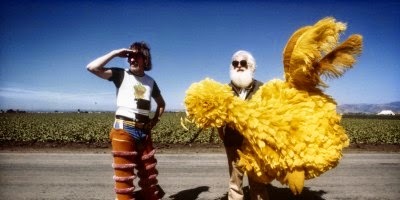 I AM BIG BIRD is one of the most magical experiences you'll ever have in a cinema. For tickets for Fridays screening (You have to go Carroll Spinney is going to be there) go to the films festival page.